President Trump’s first visit to the UN General Assembly this week will indicate whether he intends to promote America’s global engagement or double down on America first. In the process it will give some sense of the power balance within the post-Steve Bannon White House between populist nationalists such as Stephen Miller, and supporters of US global and multilateral engagement, including National Security Advisor HR McMaster, Secretary of Defense Jim Mattis and UN Ambassador Nikki Haley. For decades, Trump has been sceptical of multilateral arrangements, and preferred bilateral deals and unilateral action. As President-elect, Donald Trump tweeted that the UN was ‘just a club for people to get together, talk and have a good time'. The Administration’s budget proposal contains steep cuts of around 30% to the US State Department budget, including its UN funding. Still, it is striking that Trump appointed, in Haley, a UN Ambassador not ideologically opposed to the institution, as he has done with some other Cabinet appointments. While acknowledging the need to address the UN’s inefficiencies, Haley has signaled recognition of the UN’s value and a preference that UN reform be strategic rather than ‘slash and burn’. The UN summit will give a clearer indication of Haley’s influence with the President. A former South Carolina Governor and dexterous political operator, Haley has skilled up quickly on foreign policy and carved out her own, more traditionally Republican policy positions – often in stark contrast to Trump’s. She has promoted human rights and humanitarian assistance, for example, and quietly continued some Obama Administration positions including on Russia’s actions in Ukraine and Crimea (while in line with the President on issues such as Israel). Notwithstanding a few missteps, Haley has largely impressed foreign counterparts with her preparedness to negotiate behind closed doors if she can still attain a political win. Haley has become such a prominent Administration foreign policy voice, and such a counterpoint to Secretary of State Rex Tillerson’s circumscribed public posture, that many believe she is destined for – and seeking – higher office. Rumors have even emerged that she could replace Tillerson as Secretary of State. There are some signs that America’s UN policy under Haley is evolving to accept the UN’s utility as a tool to combat critical challenges. 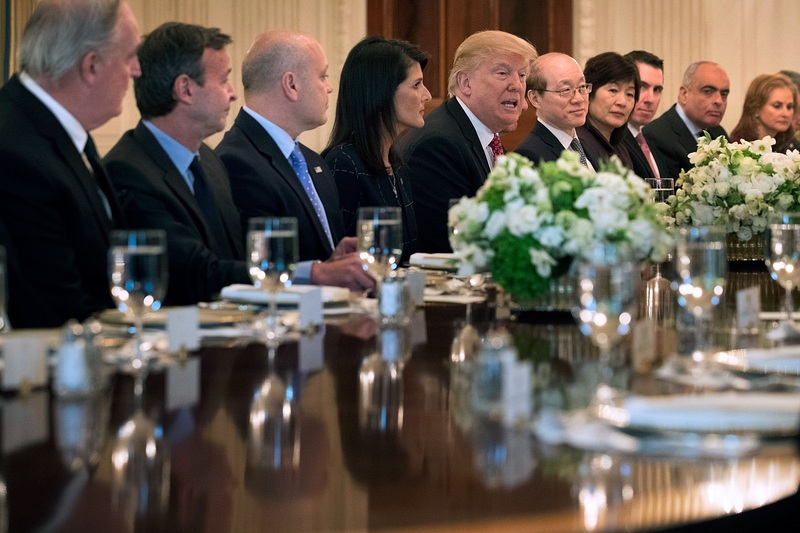 When Trump hosted Haley and her Security Council counterparts in Washington in April, he minimised the importance of reducing the UN’s budget if it could realise its broader crisis management goals. Trump’s foreign policy team has already made use of the UN’s convening power in the North Korean nuclear crisis. Trump has been publicly gratified by the ‘win’ of the unanimous Security Council votes on sanctions, while aware of its limitations. And on Monday the President convenes a high-level meeting on UN reform, which will showcase Haley’s and UN Secretary General Antonio Guterres’ UN streamlining efforts and the degree to which Trump endorses them. In his speech to the UN General Assembly on Tuesday, Trump will likely laud state sovereignty and deride the UN’s flaws as he covers topics such as North Korea, Iran and Syria. It is not clear whether his UN address will see Trump remain the arch multilateral sceptic who withdrew from the Trans Pacific Partnership and Paris Climate accord, or whether he will acknowledge that multilateralism has its uses. The President’s deal-making, relationship-based modus operandi makes him open to rapid, dramatic policy shifts, as his recent deals with Senate Democrats demonstrated. Any mention of the UN’s role in humanitarian crises such as famine will signal the influence of Ambassador Haley and Ivanka Trump, as both have focused on the issue. The Australian delegation, led by Foreign Minister Julie Bishop, will be among those listening attentively to President Trump’s speech. Canberra has an active UN and multilateral agenda and made effective use of the UN’s convening power after the MH17 tragedy. Canberra is aware that US disengagement from the UN and other multilateral initiatives is not in Australia’s interests, and that policy divergences with Washington could become more pronounced next year, when Australia likely joins the UN Human Rights Council. All eyes will be on Trump in New York this week to see which way the Presidential wind is blowing.